I am HUGE Rebecca Zanetti fan. I have read and loved her Sins Brothers series. You can find my review of the first book, Forgotten Sins here. When I saw that she had a new romantic suspense book coming out I jumped on it. Little did I know that its actually a spin off of her Sins Brothers series. *happy dance*. So, Deadly Silence is the first book in the Blood Brothers series. I’ll get right to the point. I LOVED it! Ryker Jones is our hero. Ryker along with his brothers Heath and Denver run a detective agency known as Lost Bastards. They are known for finding the lost as the name suggests. Ryker, for me was a great hero. He loved his brothers to death and was willing to do anything for them. He was protective and possessive of Zara and he was open about his feelings for her. Ryker was lethal in his own way but he didn’t hesitate to show his vulnerabilities to Zara. I just loved that about him. Zara Remington was the sweetest heroine. I’ve fallen in love all over again with Rebecca Zanetti’s writing style and how she pens down her heroines. Zara was sweet yet strong. She had bad experiences with men in her childhood because of her mother so she was hesitant to trust Ryker. But she was so genuine and kind and basically a good woman. She was also very smart and intelligent. The chemistry between Ryker and Zara was great. They were extremely attracted to each other. They were both keeping some secrets but as the book progresses we slowly start to unravel them. I really enjoyed how the intimacy was built up between Zara and Ryker. They made a good couple and they totally deserved a happy ending for themselves. Also, let’s not forget Ryker’s brothers Denver and Heath. They are both so damaged yet so determined to do anything for each other. I can’t wait for their stories. 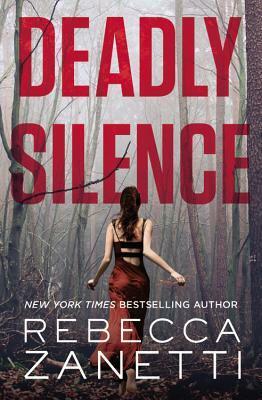 There is a LOT of action in Deadly Silence. Rebecca Zanetti weaves a fantastic story with lots of suspense. There is enough romance combined with the suspense and action to keep you hooked. I also loved seeing the Sins Brothers make an appearance. I love how complex the world is in this series where nothing is how it seems. Definitely check Deadly Silence out! *Note: A copy of this book was provided by the author/publisher via Netgalley in exchange for an honest review. We thank them.